Did you know that there tons of summer music camps close to our area for students to attend? Summer music camps are a great opportunity for students to expand their musical knowledge and abilities, learn leadership skills, improve their marching, and meet new people!!!! Below are links to a few of the summer camps within relatively easy driving distance of Dade County. You can click the camp name in the table below to visit their website for more information. Spring is very busy time in the band and school world. Here are some updates to keep you in the know. 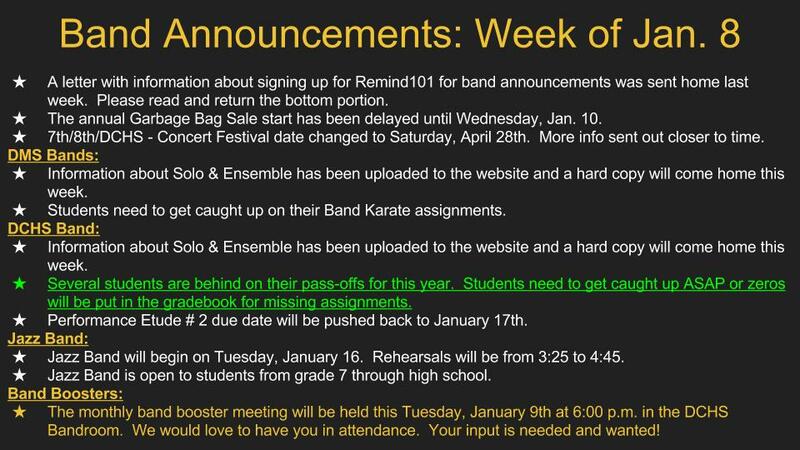 There is a band booster meeting today, Tuesday, March 12 at 6pm at DCHS. We will be discussing the upcoming concerts and banquets and need all the help we can get to help. The DMS Spring Concert is quickly approaching. It is on March 26 at 7pm in the DCHS Auditorium. Students report in their seats by 6:30. Students should be dropped off at least 15 minutes before to get set up. All students should wear all black and be in dress code. Please see the handbook for more details. Handbooks are linked to the website. The DMS Dollywood trip letter was sent last week. It is also uploaded to charms and at the bottom of this post. This is always such a fun trip and we look forward to having fun with the students. Please help encourage students to practice. Even 5 minutes a day can make all to difference in how quickly the grow as a musician. We highly encourage using musicracer.com and musictheory.net for good none playing practice. Both are free and great at reinforcing what students have learned in class. A wonderful addition is also smartmusic. This one is not free, but is very inexpensive with a yearly fee. It offers a tuner, metronome, over 1000 songs, a testing system that helps the student know what they need the most help on. Last in the list, but by far not the least, is private lessons. These are 30-60 minute private sessions between your student and an instructor. This can make a huge impact on a student. Be sure to visit the calendar to keep up to date. Have a wonderful week! Winter guard practice Mondays 3;30-7:30. Jazz Band rehearsals Tuesdays 3:15-4:15. Solo and Ensemble students (this is a sign up event) practice on Thursdays 3:15-4:30. Philadelphia students rehearsal Thursdays 3:15-4:15. 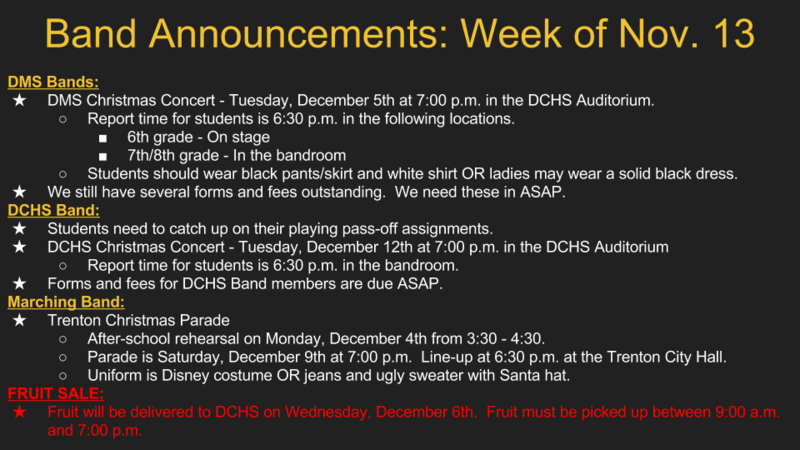 All rehearsals are at DCHS. March 9 Dade County Bands Mattress fundraiser. DCHS Commons 10:00-4:00. March 12 Band Booster Meeting. 6:00pm DCHS. We need help working concerts and preparing the banquets. We would love to have your help. March 23 Winter guard competition at Mill Creek High School. March 26 DMS Spring Concert 7pm at DCHS Auditorium. March 28 - April 1 Dade County Bands and Chorus go to Philadelphia. Shew! Busy month! Please encourage students to practice frequently. Just like learning to throw a ball, you only improve with practice. It is wonderful to watch them evolve as performers. From finally learning how to put their instruments together to creating music. They need all the encouragement to be the best they can be! Be sure to look ahead on the calendar for dates coming up in April and May. The garbage bags will be delivered Wednesday, February 20. We need help unloading at 7am. Orders can be picked up from 9 a.m. - 7 p.m. in the DCHS bandroom. Please be prepared for rain when you come pick them up. There is an overhang at the band room to help keep loading as dry as possible. All orders should be picked up by 7 p.m.
​All Philadelphia payments should already be in. There is a meeting Monday at 6 p.m. in the DCHS Auditorium to go over final details. Students will also be practicing after school beginning next week to prepare for their performance. Rehearsals are Thursdays 3:20-4:30 at DCHS. Dates are Feb. 28, Mar. 7, 14, 21. DMS students can ride the bus to DCHS. There is all band parent meeting Monday at 6:30 in the DCHS band room to go over the upcoming mattress sale. We would love to see everyone there! Students have upcoming tests at DMS on Monday, Feb. 25. Rain, rain, go away!! Please be aware that all instruments are temperature sensitive and most are moisture sensitive. No instrument should be left in a car. Due to shrinking and expanding, pads can fall out and the body have various issues occur. Wood instruments will crack. Brass instrument, while not as affected, will expand and contract, causing issues. Excessive moisture exposure can also cause molding in the cases. 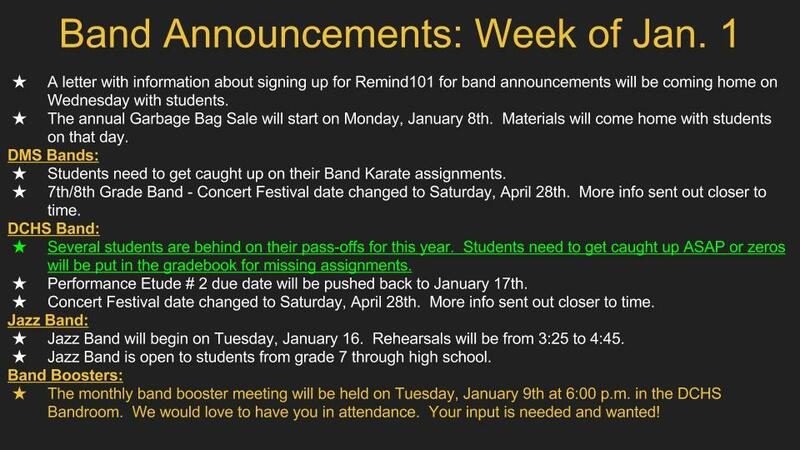 Please be sure to follow the band on Facebook and sign up for the Remind alerts. Codes for each class are listed on the home page. Have a wonderful week! The Dade County Band program will be holding a mattress sale fundraiser on Saturday, March 9th. This is a great opportunity for students to earn a custom DC jacket and MONEY ($$$$$)!!! Please see the overview of information below. We will have a parent meeting on Monday, February 25th at 6:30 p.m. in the DCHS bandroom to go over details of the sale. Oil, Grease, Spit, oh my! ​Happy Monday! The garbage bag sale ends this week with orders due by the end of school Wednesday(or the next day if weather happens along). You still have time to grab those last minute orders! Remember that for every case sold, the student earns $1 to help with band fees. More information can be located on the garbage bag sale letter. Also there is a letter coming home today. It is for solo and ensemble which is a great opportunity for all students. It is flu season. Please keep instruments clean to help keep germs away. There are guidelines for cleaning each instrument in student handbooks. Jazz band has begun. Any 7th-12th grade student may participate. Rehearsals are Tuesdays from 3:15-4:15 at DCHS. This week we will focus on valve oil, key oil, slide grease, and cork grease. Please note that for each instrument discussed, they must have these materials to keep their instrument working correctly. All are very affordable and last a very long time. We have oil and grease for sale for $3 at the school. You can also purchase online or in stores elsewhere. Weather, frequency of use(playing a lot or not), and spit are key players in how often these will be used. Clarinets and Saxophones use cork grease. Cork grease typically comes in chap-stick style tubes. A very small amount should be applied to the cork and then smoothed in. This should be done sparingly only when the cork has dried out enough that the joints(or mouthpiece) do not connect well. Grease naturally breaks down cork, so overuse will cause the cork to crumble. Saxophones may use a tiny amount to connect the neck to the body of the saxophone similar to what brass use slide grease for. Key oil is used on woodwinds. We typically do not recommend our students to use it without being shown how to use it properly. Pads should never come in contact with any excess moisture(spit happens) and because of this, key oil must be applied carefully. All brass use slide grease. Slide grease comes in a chap-stick style tube. A very small amount should be applied to the slide and gently worked in. Wipe off any excess. Slides should be checked weekly for smooth movement, but that does not mean it will need grease. Only grease as needed. Trombones will use slide grease more than others because they are constantly using their slides. They may also consider slide cream. All brass also use valve oil. A small amount should be placed on the valve and then worked in. Too much will cause build up. With regular use, an instrument may not need to be oiled for a long time, up to two weeks. With proper use, these materials will help keep the instrument performing at its best. But, remember, just like you should have regular car oil changes, you need to give the instrument a bath occasionally to help clean out the dirty oil(spit happens). Even with regular cleanings, a tube of grease or bottle of oil should last a long time. Minimum a year or longer. It's not unusual for a container of oil to last years. The DMS bands have upcoming tests next Tuesday. The 6th grade will be testing 3.9 in their Measures for Success, 7th will perform Lonesome Dove, and 8th will perform He's a pirate. Students can upload tests in their google classroom(codes on the home page) or perform for us in class Tuesday. 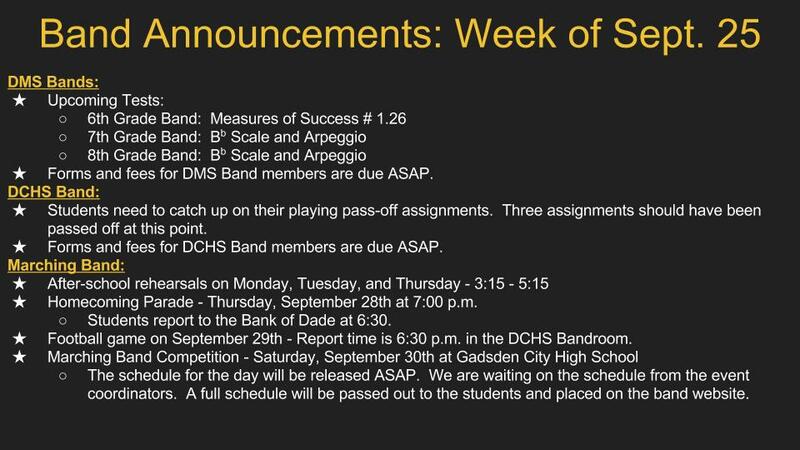 The DCHS band completed a test just before the break and will receive that back asap. Please help encourage students to practice so they can do their best. Reeds? What even are Reeds? Let's talk reeds! Reed players need a minimum of 3 reeds. Like any wood like material, reeds wear down from their constant exposure to moisture and the drying out. However, by rotating reeds every day, it helps the reeds last longer. You never want to perform a concert on a new reed because it has not been 'broken' in by being used. New, dry reeds will cause squeaking until they can go through the process of curing(wet to dry). Reeds come in different sizes. The smaller the size, the thinner the reed. Younger students tend to do best on lower numbers because they are developing the muscles needed to perform. We do not recommend using anything smaller in size than a 2.5. As players continue to play, they tend to need to move up in size to balance with their muscle development. You move up in 1/2 steps and we are happy to let them try new sizes as we have them. If they change sizes, but still have a lot of the previous size, we typically can work out a reed swap so you are not out extra money when they need to change. If you have any questions about the best way to order new reeds or the brands to order, please let us know. Students are encouraged to listen to the uploaded practice recordings located under their school, then grade. Stay tuned for next week when we talk valve oil, slide grease, and cork grease! The trash bag sale is in full swing. Students are encouraged to sell 10 cases( or donation equivalent) in order to go to the Party on March 1st. The party is at DCHS from 3:30-7pm. More details to come. We are really excited to get started in the new year! Please be sure to check the calendar to keep up to date and check charmsoffice.com for any other information(how to log in is in the handbook shared on this site). Winter guard season is kicking off at the high school and concert bands will be gearing up for their spring concerts. Be sure to check out the practice recordings as most have already been updated. Remember, if you are in 8th or high school band and are going on the Philadelphia trip, send in payments. The trip is fast approaching and we can't wait to see 'the room where it happened'! We will be selling Dade County Fine Arts t-shirts for $10 for all of January. All proceeds go toward the Fine Arts Department. It's time to get trashy! The sale is from January 9 - 29. Cases are $25. Sizes are 13 gallon(250 per case), 33 gallon(200 per case), and 55 gallon(50 per case). Orders can also be made here on the website once the sale opens. Please be sure that all reed players have plenty of reeds and cork grease. We keep an emergency supply only for students to purchase from us. Students should have 3-5 at all times. Please make sure all brass have valve oil and slide grease. Proper maintenance is critical to a great performing instrument. Admission cost for spectators is $8.00. Below is additional information for spectators at the Armuchee Invitational on Saturday, September 29th. PARKING: There is no spectator parking on AHS campus. Only buses and equipment trailers will be permitted on campus. Parking for anyone not riding a bus or not driving an equipment trailer will be at Northside Church directly across Highway 27 from AHS. Parking is FREE and the address for Northside Church is 75 North Floyd Park Road, Rome, GA 30165. HANDICAP PARKING: There is a limited amount of handicap parking on campus. Anyone who parks in this area MUST have a handicap pass that is current. Anyone else will be asked to park at Northside Church. SHUTTLE: There is a free shuttle from Northside Church to AHS and back all day. The shuttle will drop off and pick up at the main ticket gate throughout the day. ADMISSION: Admission is $8 for anyone age 6 and older. The main admissions gate has been moved. I have attached an updated map to this email. REMIND: I have added you to a Remind Text group. I will use this for communication in case a message needs to get to you during the day. If you did not get added to the group, please text @armucheei to 81010. Please only allow directors to join this group (no parents, students, etc.). WEATHER SHELTERS: We honestly hope and pray that we don't have to worry about this, but we experienced a lightning delay last year for the first time since hosting a competition. In the event of severe weather, we will move everyone into one of three locations. Please make your chaperones aware. You can put your students on your buses if you wish to avoid one of these three locations. Shelter 3 is the auxiliary gym and located directly across from the baseball field. This shelter is for paying audience members. Shelter 2 is the main gym and is attached to the main school building. This shelter is for students who have already performed and their chaperones/directors. ONLY PEOPLE WITH A WRISTBAND WILL BE ALLOWED IN THIS AREA. Shelter 1 is the auditorium and is also attached to the main school building. This shelter is for students who are in warm-up and their chaperones/directors. ONLY PEOPLE WITH A WRISTBAND WILL BE ALLOWED IN THIS AREA. 1. Reminder about the evening rehearsal on August 10, 2018. Rehearsal will be from 3:30 - 9:00 p.m. We will feed students dinner at school. 2. There is NO after school marching band rehearsal on Monday, August 13. 3. Report and departure times have been updated on the Charms calendar for away games. Competition times will be updated as soon as we have a schedule (usually not until a week before). Students need to have passed off a minimum of their Green Belt AND be in attendance at all concerts during the school year. Please change the date for concert festival from March 15/16 to APRIL 28th. We will be traveling to Hiwassee College in Madisonville, TN. Times will be given closer to the event. We will also be having District Honor Band practice on Tuesday from 3:15 to 4:30.